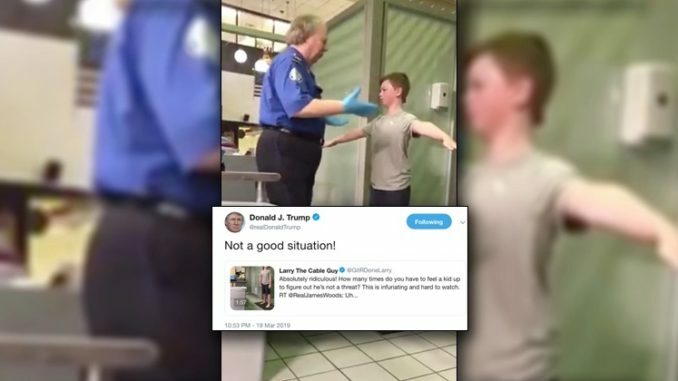 President Trump has condemned the TSA after a viral video surfaced showing a perverted agent groping a young boy as part of an invasive pat-down procedure at a US airport. “Not a good situation,” the president tweeted, retweeting a video shared by comedian Larry the Cable Guy. “I’m sure this young man could have been deemed to not be a threat in a matter of seconds. Wtf!” Don Jr. tweeted. The video, which first appeared in 2017, shows a boy at Dallas’ JFK airport undergoing a full pat-down which lasted approximately two minutes. At the time the boy’s mother, Jennifer Williamson, who filmed the encounter, also mentioned her son suffered from a sensory processing disorder, compounding the incident’s absurdity. As the video went viral, the TSA went into damage control mode, penning a blog post titled, “TSA Mythbuster: The Rest of the DFW Pat-down Story,” which attempted to explain why the over-the-top search was required. Trump’s retweet of @DeepStateExpose, who was identified as conspiracy-minded Twitter user Jeremy Stone, will likely “raise new questions about where a president fond of spreading conspiracy theories gets his information,” The Post writes.